Pipelines are a long-established, safe and efficient mode of transport for crude oil and petroleum products. They are used both for short-distance transport (e.g. within a refinery or depot, or between neighboring installations) and over long distances. An extensive network of cross-country oil pipelines in Europe meets a large proportion of the need for transportation of petroleum products. 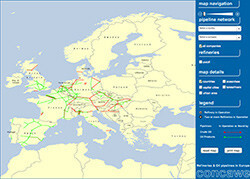 The network of refineries and pipelines in Western Europe is illustrated in the interactive map below. Since 1971 Concawe has been collecting facts and statistics on incidents and spills related to European cross-country pipelines. Results are published yearly in a report including a full historical analysis. Third party interference has been identified as a major factor in many spills and to address this issue Concawe supports the replication of existing initiatives across the EU (such as one-call systems, as used in the Netherlands and France), to better control third party activities that could result in pipeline damage. Other activities in this area include responding to various legislative initiatives concerning pipelines, particularly from the European Commission, but also from national governments. Concawe also represents the oil and product pipeline sector in the EU Thematic Network for Critical Energy Infrastructure Protection. This field of Concawe’s activity is open to all companies operating oil pipelines in Europe, whether or not they are a Concawe Member Company. It provides a forum for the exchange of information between pipeline operators on technical progress and lessons to be learned from incidents. In addition, a COPEX (Concawe Oil Pipeline Operators Experience Exchange) seminar is organized every four years for the benefit of all pipeline operators in Europe. Attendance is by invitation only. Monitoring the safety and environmental performance of Europe’s oil pipelines.